DANGER! WARNING! CAUTION! You may see these labels on common household products, but have you ever read them carefully? Most of these labels actually state that consumption of the product at hand can be fatal to an average sized adult. Some household chemicals that can kill you would only need to be a mouthful swallowed, others between a teaspoonful and an ounce, and others up to a pint. But no matter what the warning label is, you must heed with caution. Cleaning the house or undertaking a DIY project doesn’t mean you have to contaminate your home or your water supply with dangerous chemicals that are potentially deadly. There are a few very dangerous chemicals in air fresheners. Formaldehyde for one is a cancer causing chemical that irritates the lungs as well as the mucous membranes. Petroleum distillates are irritable to the eyes, lungs, and skin, are highly flammable and can induce lethal pulmonary edema. Inhaling the flammable aerosol propellants can cause damage to the nervous system. Inhaling ammonia will irritate the mucous membranes and lungs. Touching ammonia with bare skin can cause severe chemical burns. Mixing ammonia with bleach is extremely dangerous, as it creates an even more reactive chemical known as chloramine which can kill you. Triclosan can be found in many antibacterial cleaners. When triclosan is absorbed into the skin, it can cause damage to the liver. Antibacterial soaps and cleaners can also cause drug resistant bacteria to develop. Among all household chemicals that can kill you, antifreeze should never be missed out. Ethylene glycol, or antifreeze, is highly poisonous if ingested. Just casually breathing in antifreeze can make you very dizzy. Swallowing antifreeze can cause serious organ damage or failure to the kidneys, heart, and brain. Kids and animals are attracted to ethylene glycol because the taste is quite sweet, and sometimes the flavor killing properties of antifreeze aren’t enough to keep curious taste buds away. The sodium hypochlorite in bleach can cause respiratory damage if inhaled, and irritation to the skin if spilled. Besides, if bleach is blended with other household chemicals like ammonia, drain cleaners and toilet bowel cleaners, it will yield fumes that are deadly if inhaled. Most carpet and upholstery shampoos contain two very dangerous chemicals. One is ammonium hydroxide which irritates the lungs, skin, and eyes, as it is highly corrosive; and the other is perchlorethylene which is a carcinogenic chemical that can damage the nervous system, liver, and kidneys. Inhaling the petroleum distillates in many car washes and polishes can cause fluid in the lungs, or pulmonary edema. Petroleum distillates can also cause cancer of the lungs and skin, and will irritate the eyes and nose. The most common chemical to poison children is chlorine, and most dishwasher detergents contain highly concentrated levels of it. Drain cleaners commonly contain sodium hydroxide, sulfuric acid, hydrochloric acid, or tricholoroethane. These chemicals can do a number on the body from causing blindness if splashed into the eyes to serious chemical burns on the skin. 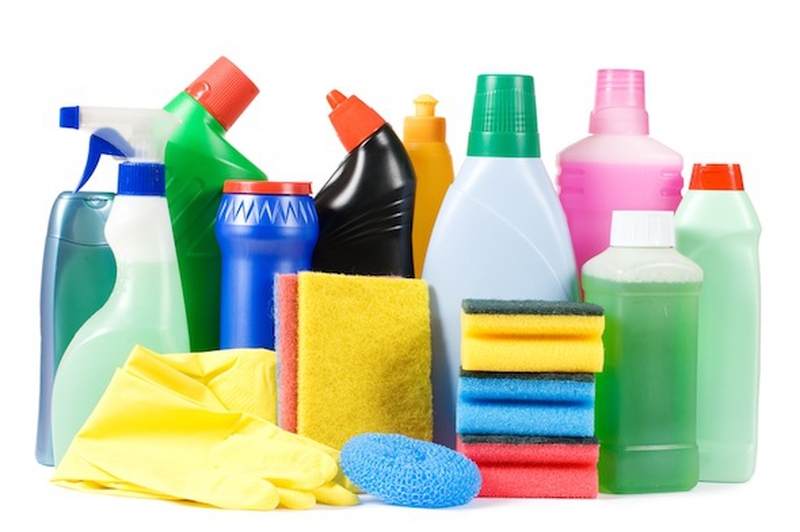 If swallowed, these are household chemicals that can kill you. The nitrobenzene and phenol in furniture polish is known to cause both skin and lung cancer. These chemicals are extremely flammable and are very easily absorbed into the skin. Many perfumes and dyes in laundry detergents can cause allergic reactions in some people. Swallowing the chemicals in laundry detergent can induce a coma, and cause vomiting, nausea, and convulsions. Birth defects, stillbirths, liver damage, cancer, total circulatory system failure, convulsions, and vomiting are all effects of the ingestion or absorption of lindane which is a common ingredient in many lice shampoos. Formaldehyde and sodium hypochlorite are both found in mildew and mold cleaners. These chemicals can cause pulmonary edema (fluid in the lungs) and cancer. Mothballs are either made of naphthalene or p-dichlorobenzene, which are both toxic chemicals that will cause headaches and dizziness. They can also irritate the respiratory system, skin, and eyes. Extended contact can lead to liver damage and the formation of cataracts. Cancer can develop after exposure to the hydrocarbons found in motor oil. Also, the heavy metals in motor oils can cause major damage to many organ systems. Oven cleaners that contain a base of potassium hydroxide or sodium hydroxide are deadly if ingested. If inhaled, chemical burns can develop in the lungs; and if spilled, chemical burns form on the skin. Diazinon, otherwise known as dimpylate, is highly toxic. Pesticides can damage the central nervous system. Rodenticides, although safer these days than before, are poisonous to both pets and people. Warfarin, a common ingredient in rat poison, can cause internal bleeding if swallowed. Many toilet bowl cleaners will either contain hydrochloric acid or hypochlorite bleach, both of which are highly toxic. Windshield wiper fluid contains ethylene glycol, the same chemical found in antifreeze. Ethylene glycol ingestion can lead to damage of the heart, kidneys, and brain, and can also be fatal. Windshield wiper fluid may also contain methanol, which if ingested, inhaled, or absorbed into the skin can cause blindness, and damage the liver, brain, and kidneys. The isopropyl alcohol in windshield wiper fluid can depress the central nervous system, and cause severe drowsiness or unconsciousness, and of course, death. If you blend some of the household chemicals that can kill you with some other things, the consequence can be life-threatening. Here are some chemical combinations that should be avoided at all cost. Mixing vinegar and bleach creates a toxic chlorine gas. The weak acids of vinegar mixed with bleach will release toxic vapors into the air of chlorine and chloramine. These chemicals can cause severe chemical burns in your eyes and lungs. The lethal chloramine vapors that develop from mixing bleach with ammonia can burn your throat and cause respiratory damage, and possibly even death. It’s important to look at the ingredients of common household cleaners like window spray and drain clearing liquids before mixing them. The nervous system, lungs, eyes, liver, kidneys, and skin are all at risk when mixing rubbing alcohol with bleach. The sodium hypochlorite in bleach reacts with isopropyl alcohol and produces chloroform which can have a range of effects from minor (dizziness, nausea) to grave (death). While both of these products are natural cleaning agents, you should never mix them together. The corrosive paracetic acid that results upon mixing hydrogen peroxide and vinegar can be extremely irritable to the lungs, eyes, nose, throat, and skin. It can also cause permanent scarring on the corneas, throat, and skin.